Mairie d'Issy is a station on line 12 of the Paris Métro in the commune of Issy-les-Moulineaux. It is near Issy-les-Moulineaux town hall and the shops located in Avenue Victor Cresson and Avenue de la République. The station serves as the southern terminus of Paris Métro Line 12 and opened opened on 24 March 1934 as part of extension of the line from Porte de Versailles. 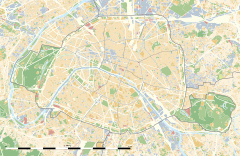 Wikimedia Commons has media related to Mairie d'Issy (Paris Metro).